The canyon’s natural wonder is unlike anything on Earth, and Pink Adventure Tours is your personal expert guide for this phenomenal experience. 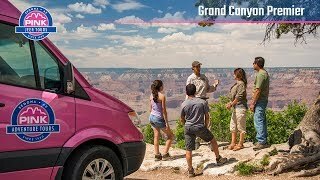 Our Grand Canyon Premier Tour offers an unparalleled journey of style and comfort on your way to one of the Seven Wonders of the World. Your Certified Interpretive Guide will meet you at the Pink® Jeep® Tour Plaza in Sedona, where your customized, pink Mercedes Sprinter vehicle awaits. Relax in roomy captain’s chairs, indulge in a boxed lunch of your choice and enjoy views through large windows as you head north. Sedona leads into Oak Creek Canyon, which is home to Slide Rock State Park and its natural rock water slide. Flagstaff, whose downtown sits along historic Route 66, marks the approximate halfway point of the trip as miles of Ponderosa pines line the way to Grand Canyon National Park. Your return trip will showcase the Arizona high county once more, as you head from the majestic splendor of the Grand Canyon back through the cool pines. It will be an experience you’ll remember for years to come, and this is what Pink Adventure Tours does. Come explore with us. Great way to see and experience the Grand Canyon! Our tour guide Mark was entertaining and very informative about all the locations we drove through during our trip and of the Grand Canyon as well. So happy we decided to take this tour instead of trying to do it on our own. The GC Premier tour was one of the best days of my life! Initially I was going to drive myself to the GC and take your tour from there because I was afraid of motion sickness going through Oak Creek Canyon. I am so glad I took the tour all the way from Sedona. This tour is such a stress free way to see the GC and you learn so much from the guide. I would have missed out on a lot of cool info had I driven myself. I was educated and entertained the whole way there and back and it was a huge relief not to drive. I had zero motion sickness so I worried for no reason. Tour was amazing. Joaquin was AMAZING! He helped my boyfriend surprise me with a proposal. He was so great. This was an amazing tour! We commented several times that we were so glad we took a tour our first time to the Grand Canyon. David was an amazing guide and brought the Canyon to life for us. Because of his knowledge and stories, we can't wait to come back again!!!! Thank you! Joaquin was a great guide. He was very informative all through out the tour. He gave info about the native plants and animals, history of the areas we drove through, and showed us beautiful spots in grand canyon park.